Read-out Instrumentation Signpost: "World Cup of Automation!" The agenda for the Copa-Data Global Partner Academy 2018 included presentations and in-depth workshops with experts, practical reference visits and international networking under the event slogan "World Cup of Automation". 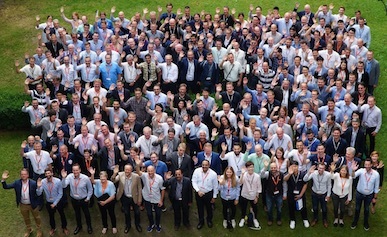 This year's Copa-Data Global Partner Academy (GPA) in Vienna (A) had 215 participants representing 98 companies from 30 countries. The third-annual GPA, the worldwide rendezvous for members of the company's partner community, brought together twice as many people as it did in 2016. Johannes Petrowisch, Head of Corporate Partnerships at Copa-Data, was delighted by this growth, commenting: "This GPA shows the continuous growth trajectory that we and our partners are experiencing worldwide. It is a strong sign that our zenon software is delighting so many experts throughout the world and that automation is advancing in harmony with digitalization. We would like to warmly thank all participants." One highlight was an insight provided by Ulrike Huemer, lawyer and CIO of the city of Vienna, into city development and planning for one of Europe's largest and, at the same time, most liveable city regions. The city of Vienna has already been following a digital agenda for increasing transparency and decreasing bureaucracy for its citizens for several years now. In the lawyer's speech, she focused on a key challenge for the coming years: interlinking all social sectors that are involved in the digital transformation. International participants at GPA 2018 agreed with her conclusion that only through open discussion and dialogue between economy, industry, society and public authorities can the advantages of digitalization take effect. Furthermore, Copa-Data partner companies obtained extensive know-how on the new zenon 8.00 and zenon Analyzer 3.20 software versions. Example applications from around the world underscored the variety of solutions that can be implemented with zenon – from ergonomic human-machine interfaces and powerful control stations to cloud-connected production analyses across different locations. GPA participants benefitted both from face-to-face conversations with company technology experts and in-depth workshops on technical and sales topics. The agenda was rounded off by two reference visits. In the energy distribution sector, participants at Wiener Netz's premises were able to get an idea of how 46 transformer stations and a 28,000 km distribution network provide energy to the city of Vienna and other parts of Austria. In the pilot factory for Industry 4.0, which was initiated by TU Wien, the Technical University of Vienna, GPA 2018 participants gained insights into the future of industrial production with a focus on smart, cyber-physical production systems. The Copa-Data British technical & sales team accompanying partners Roy Coleman and Lee Hancock of Applied Integration and Capula. From weaving to optical sensors. Efficient connections for the Ex zone. 40 years serving automation in Ireland. Safety relays are diagnostics enabled! Loadcells for harsh but hygenic applications. Flexible probe for hard-to-reach places.